A broken toilet flange might seem like a minor catastrophe at first because replacing it would likely involve opening up the floor or ceiling to expose the piping, but there are numerous products on the market to repair the broken flange instead of replacing it. Most of these products however; are only designed to repair the part of the toilet flange that rests on the floor and secures the closet bolts, if your flange is broken down to the pipe or in the cupped section of a plastic flange then you will have to replace it. The image above shows a broken brass toilet flange connected to an old cast iron drain that was set inside a poured concrete floor. Replacing the toilet flange would have involved jack hammering up the floor and lots of time, but a simple eight dollar repair flange and 20 minutes later it was good as new! 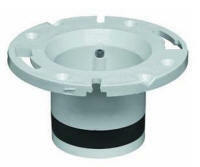 The Super Ring is an excellent product for repairing a damaged toilet flange. It's very thin but made from a singe piece of durable metal and has lots of holes for fastening it down over the broken flange. The image below shows one installed with concrete anchors(click to expand). Another product that will repair a damaged toilet flange is Fernco's Fix-a-Flange, which simply goes under the damaged section and gets bolted/fastened to the existing flange. 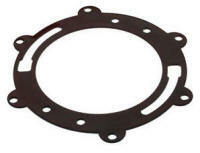 These toilet replacement flanges; manufactured by Oatey, are made to push into a 4" cast iron drain or plastic pipe and seal against the internal diameter with a rubber gasket. Although they make a flange that fits inside a 3" pipe, they are not permitted because they reduce the internal diameter.